With a large sigh of relief, weatherproofing begins. 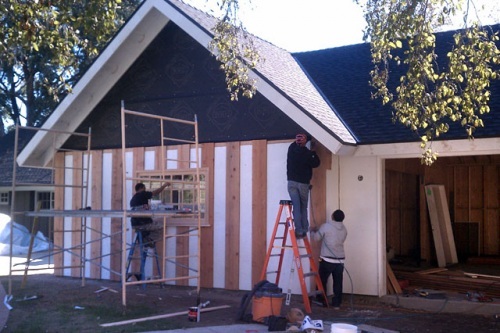 The walls are wrapped in tar paper. With the walls complete, we move to the roof. Paper is complete, so it’s time to call the roofers. A very exciting moment because the structure will now be protected against damage from weather. 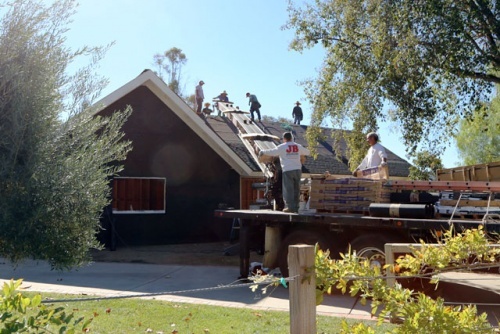 Due to the very steep roof, some of it nearly 45-degrees, planks are mounted to hold the materials in place as work progresses. Flashing begins to make its way around the edge. The roofing is complete at last! We are very happy to move past this point in the project. 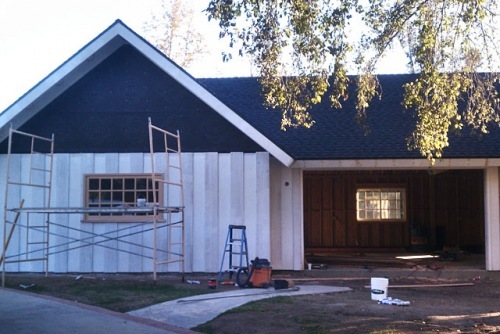 The first layer of exterior siding begins to go up. This makes it look less complete for the time being but only until the second layer goes on. Primer is applied to the first layer and allowed to dry. The MG TC and MGB GT find their way into the garage on a no-work day. The MGA and MGC both gave up on us and moved to a relative’s garage. Primer in the rear, and the back door is boarded up as painting begins. The second layer of siding goes up. These are 12″ redwood planks. The outer layer of siding primered and ready for paint! Cedar shingles are installed to the front and rear gables. The majority of the construction equipment is moved out, leaving our front yard as clean as it has been since we started. I’m sure the neighbors are nearly as happy as we are! Excitement builds once again as paint is applied. 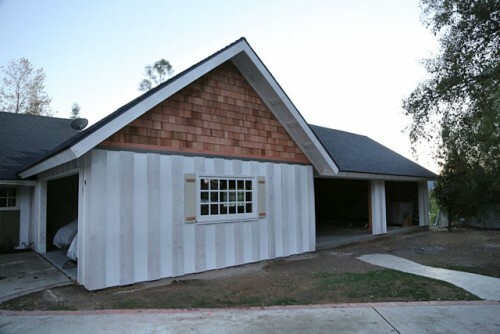 Shingles are coated in solid stain, siding in green paint and eaves in white. Shutters are a shade of black. The rear is painted to match. The happy wife begins to move her garden items closer to the garage. The rear is now mostly complete as some lighting is wired up. Fences begin to move back into place and more construction equipment is taken away, making it feel like a home again instead of a construction site. Some stepping stones removed weeks ago are re-purposed into a makeshift path to keep us out of the mud when it rains. And most importantly, the cars all roll inside and breathe their own sigh of relief.